I don’t know about you, but I guess there are several creatures in this world (mythic ones or otherwise) that have a universal appeal to everyone, and the magical unicorn seems to be one of them. 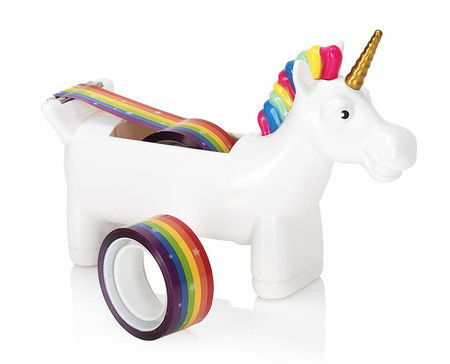 Rainbows and unicorns do seem to go together hand-in-hand, and perhaps this is why the $12.99 Mystical Unicorn Rainbow Tape Dispenser is enchanting enough to warrant a purchase. It comes with an always smiling unicorn face, and the amount of joy it exudes is as though it can poop rainbows at any time, making him the perfect foil for a tape dispenser with a rainbow pattern, of course.